Femininity and Vitality are the ingredients of Trussardi Delicate Rose, a subtle bouquet of emotions that evoke elegant, graceful femininity. Modern, sophisticated and sensual, this fragrance expresses intensely romantic sensations and is illuminated by subtle reflections of rosy light. The fruity crispy and sparkling top notes reveal a delicate floral bouquet in heart. This joyful note ends with a most sensual trail for a cozy delightful fragrance. This fragrance instantly delights with its freshness. The vitality of Kumquat and the sparkling notes of Yuzu develop sheer nuances as they marry with the purity of Bamboo. 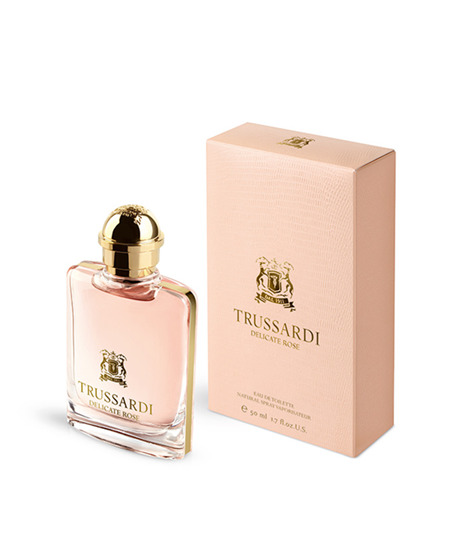 Femininity and delicacy are the stars of this fragrance. Together with the transparency of Lotus Flower, the precious notes of Rose Petals and Jasmine compose a floral harmony. Facets of crisp Apple add spontaneity and character. In the enveloping base, Musk pleasantly caresses the skin. Sophisticated and fluid notes of White Woods accentuate the tactile aspects of the fragrance while Cedar Wood and Sandalwood express innate sensuality.